Thanks for the scans D$. More available here. The bad news: no new lenses? Also, do not expect D400 on Monday. The professional SLR world has been transformed in just 12 months by the introduction of no less than four new Nikon pro SLR bodies. First we saw the D3 and D300. Then there was the D700. Now, with the launch of the D3x, Nikon offers more FX format pro cameras than any other manufacturer. 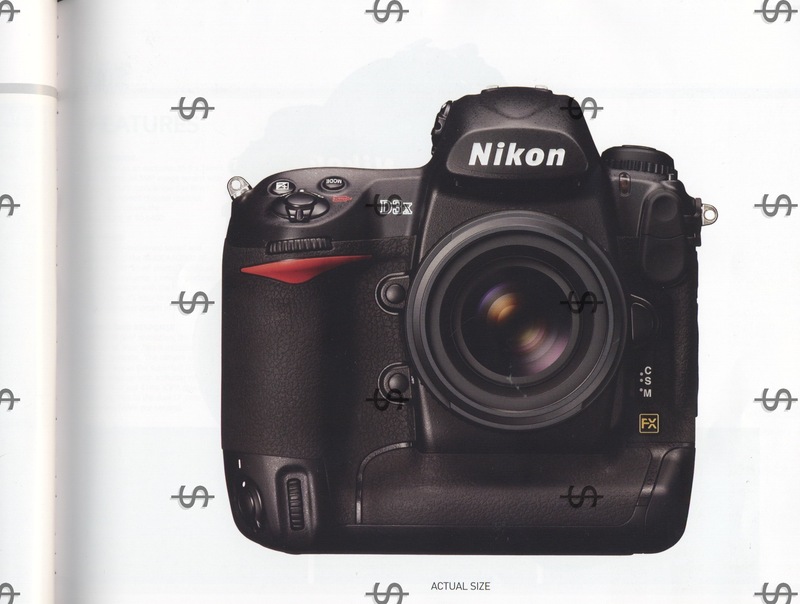 At 24.5MP, the D3x has the highest resolution seen in a Nikon SLR to date. The new camera shares all of the D3’s features, including Live View (making it the world’s highest resolution SLR with viewscreen shooting); the 51-point MultiCAM3500FX autofocus system; Scene Recognition System; Expeed 16-bit processing; 3-inch high-resolution 922.000-dot viewing screen; and the tough, weather-resistant magnesium body. The D3x was designed with medium format photographic applications in mind. The ISO range covers 100-1600 with a Lo1 (equivalent to ISO 50) as well as boost settings up to the equivalent of ISO 6400. But it’s also fast. The D3x can record its high-resolution 24.5MP files at up to 5fps. As with the D3, it has two alternative crop modes: 5:4 and DX In DX crop mode the camera captures 10MP files at up to 7fps. The MultiCAM3500FX AF system is the same as the D3, and has the largest number of individually selectable focus points available, making this a very effective system for isolating fine details in the scene. The widely acclaimed Autofocus Tracking capabilities are, as you would expect, the same as the D3. Pixel numbers alone do not guarantee good quality pictures. The D3x Expeed image-processing system is custom-designed to render this detail with levels of tonal gradation never before seen in a DSLR. Its 75MB files are ideally suited for stock photography and extremely high levels of enlargement. 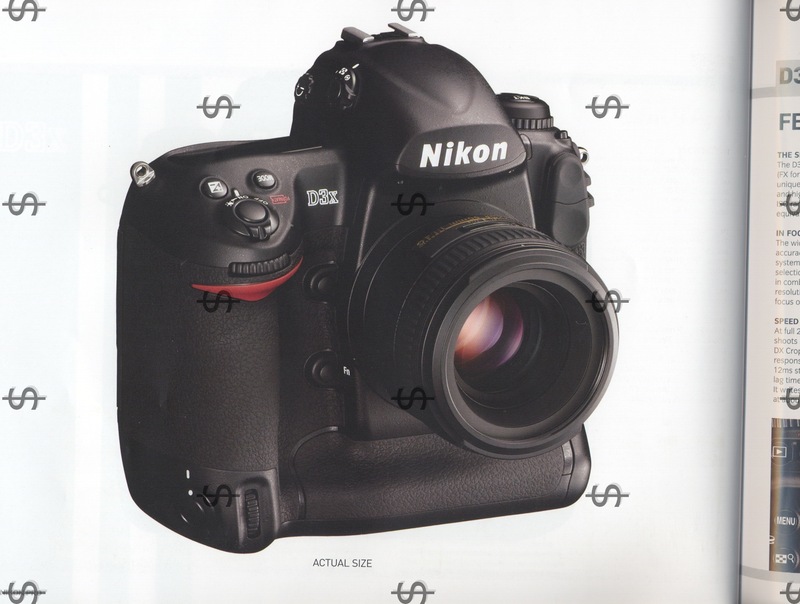 And being a Nikon SLR, its body is much faster, intuitive to handle and ergonomically advanced than heavy and complex medium-format systems. You’ll have guessed by now that the D3x is armed at photographers whose work requires the ultimate in detail and output quality Where skin tones, fabric textures, crisp edges, and foliage are paramount - in the fashion, commercial and landscape area - the D3x excels. Beyond the confines of the studio lighting environment, the onboard exposure metenng and AWB systems make the D3x equally at home in less controlled lighting situations where the aim is to capture the atmosphere of ambient lighting. 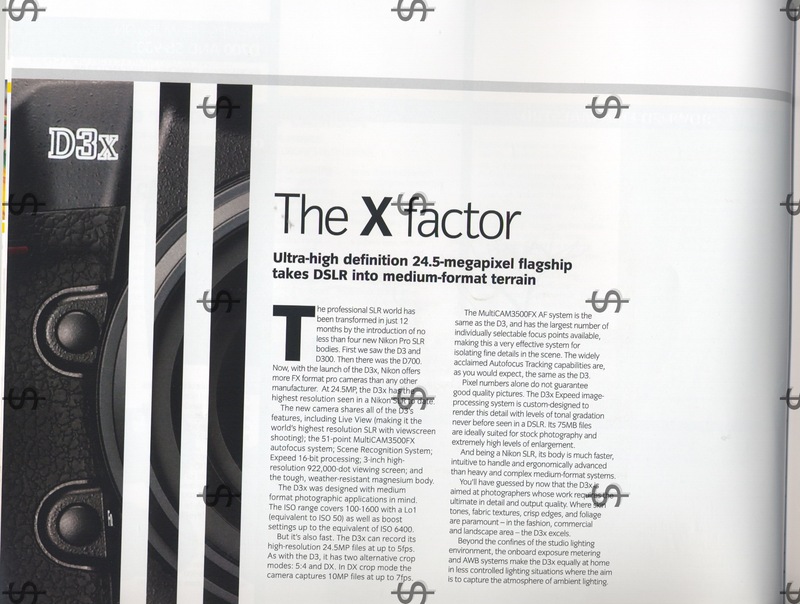 The D3x has an exclusive 35.9 x 24mm (FX format) 24.5MP image sensor with unique OLPF (optical low pas filter) and high-speed channel readout. ISO range covers the equivalent of 50-6400. The widely acclaimed speed and accuracy of the MultiCAM3500 AF system with 51-AF points. Individual selection assumes a new importance in combination with the high resolution: it’s easy to isolate and focus on small details in the scene. At full 24.5MP resolution, the D3x shoots at 5fps, 7fps is possible in DX Crop mode. The camera is as responsive as the superfast D3. 12ms start up with a shutter release lag time of just 41 ms (CIPA standard). It writes files to the dual CF slots at about 35MB per second. The D3x’s 16-bit EXPEED engine is specially tuned to deliver detail-rich, colourful files with low levels of noise and high detail. It is also tuned to minimise the effects of colour fringing with older F-mount Nikkor lenses, and to minimise the effect of unnatural-looking (digital) noise patterns. Vignette (peripheral fall-off) can also be controlled for creative effect. The D3x features a new Extra High Active D-Lighting setting, designed to better manage extremely high-contrast scenes, especially tonal gradation in highlights. Information from the 1005-pixel RGB sensor with diffraction grating is used to recognise the subject position and colour prior to capture. The results are then used by autofocus, auto exposure and auto white balance. The D3x is the highest resolution digital SLR yet to offer Live View. Allowing photographers to compose and shoot via the 3in monitor instead of the viewfinder brings a variety of practical advantages both in the studio and on location. 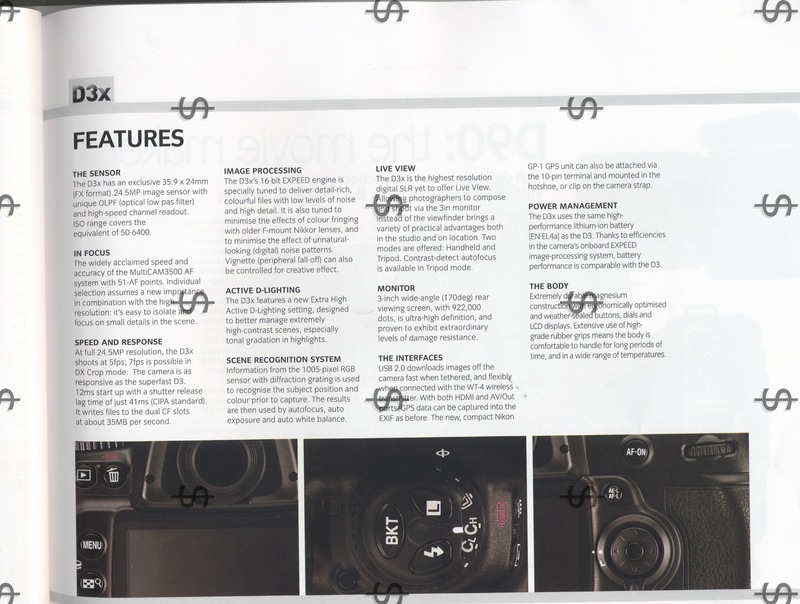 Two modes are offered: Handheld and Tripod. Contrast-detect autofocus is available in Tripod mode. 3-inch wide-angle (170deg) rear viewing screen, with 922,000 dots, is ultra-high definition, and proven to exhibit extraordinary levels of damage resistance. USB 2.0 downloads images off the camera fast when tethered, and flexibly when connected with the WT-4 wireless transmitter. With both HDMI and AV/Out ports GPS data can be captured into the EXIF as before. The new, compact Nikon GP-1 GPS unit can also be attached via the 10-pin terminal and mounted in the hotshoe, or clip on the camera strap. The D3x uses the same high performance lithium-ion battery (EN-EL4a) as the D3. Thanks to efficiencies in the camera’s onboard EXPEED image-processing system, battery performance is comparable with the D3. Extremely durable magnesium construction with ergonomically optimised and weather-sealed buttons, dials and LCD displays. Extensive use of high-grade rubber grips means the body is comfortable to handle for long periods of time, and in a wide range of temperatures.